The sisters of Noah, Lebanon. They witnessed the rise and fall of civilizations, stood against plagues and epidemics, greeted the sun rising and setting down over thousands of days, yet stood defiant in glory and glamour. These are the oldest olive trees alive bearing their soulful fruits, giving their golden oil and teaching mankind a lesson in sustainability. Olive tree(Olea europaea) is an evergreen tree belonging to the genus Olea, the family Oleaceae and the order Lamiales. According to fossil findings, the olive tree has its origins 20 million years ago in the Oligocene region that includes Italy and the East Mediterranean basin. 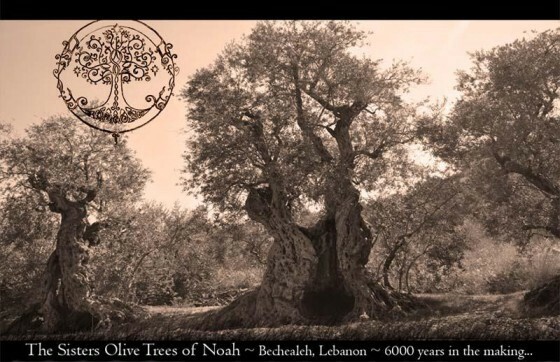 The tree was planted first in the Mediterranean some 7000 years ago. 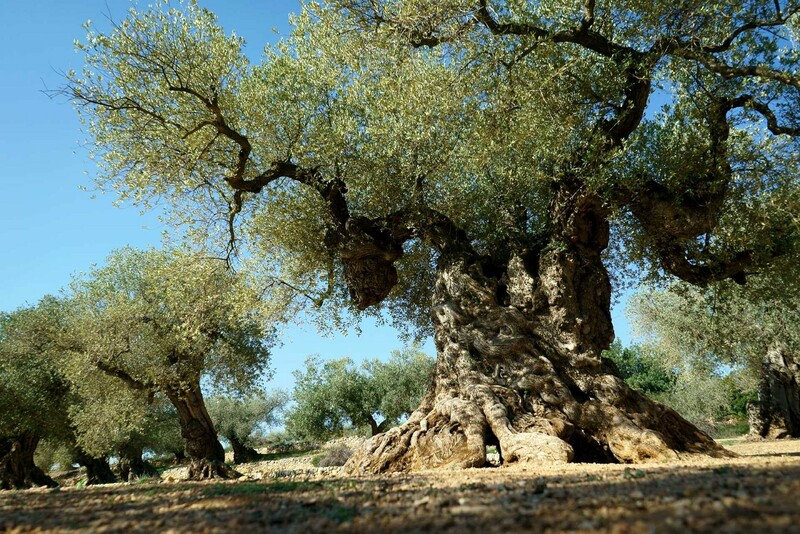 Several countries claim to have the oldest living olive trees. 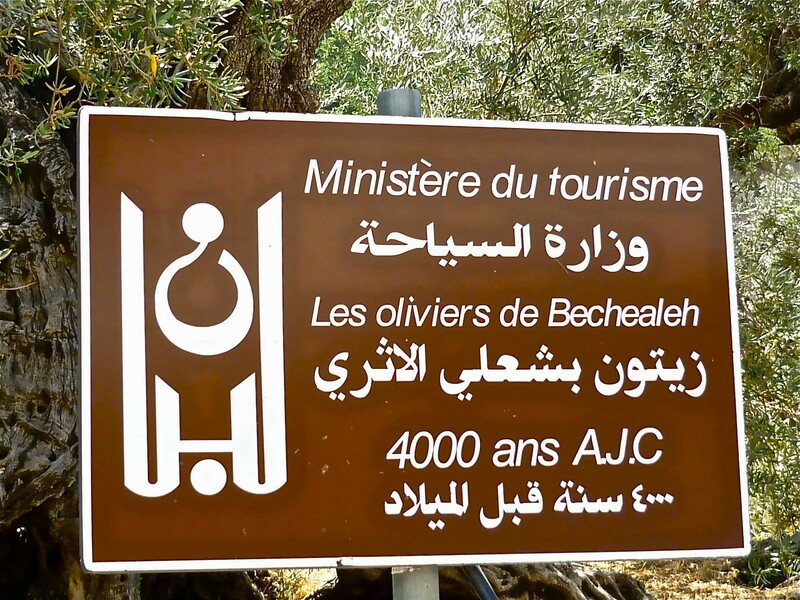 A welcoming sign by The Lebanese Ministry of Tourism to the olive trees of Bechealeh. I will cite the top oldest trees that are believed to be so but not scientifically documented. 1-The Sisters(الأخوات. أخوات نوح). In Northern Lebanon in the village of Bechealeh بشعلي ) ه) . These 16 trees are thought to be 6000 years old. They are claimed to be the source of the olive branch brought by the dove back to Noah heralding the end of the flood. 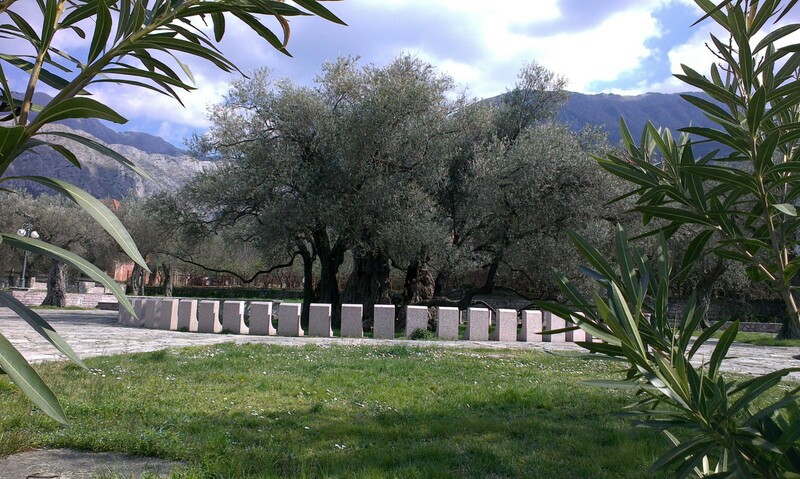 At altitude of 1300 meters, they are the highest planted olive trees. They still produce olives that are cold pressed to give an olive oil of extra ordinary quality. It is low in acidity that ranges between 0.18 to 0.24. Very high in polyphenols with a taste that includes notes of almonds, pepper and Herbes de Provence. Locals strive to preserve these ancient trees. The trunk of one of the sisters is around 28 meters in perimeter. 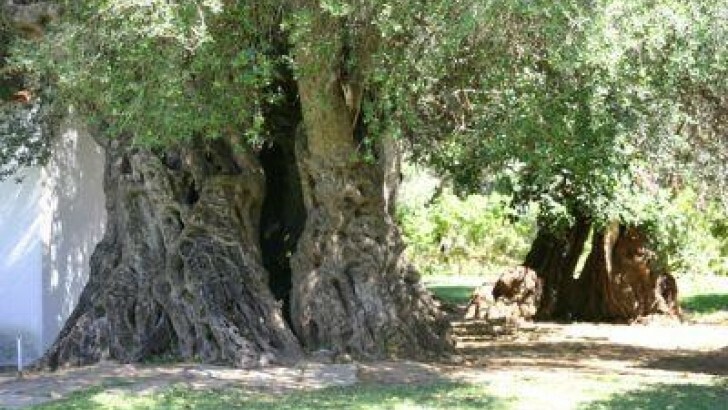 “Vouves Olive Tree” on the Greek island of Crete is estimated between 3000 to 5000 years old. 2-Vouves Olive Tree. This tree is found on the Greek island of Crete and is thought to be between 3000 and 5000 years old. It is a living example of antiquity. Winners of the ancient Olympic games were given an olive wreath. Homer called the oil “liquid gold”. The tree is visited by 20,000 people each year. image by: Michalis Polychronakis. It was declared a “natural heritage monument” in 1997 By the Secretary General of the Region of Crete due to its historical and ecological importance. Every year over 20,000 people from all over the world visit the ancient tree. Bidni olive trees trunks. image by: PolluxWorld. 3-Bidni olive trees. Bidnija is a rural hamlet in the northern region of Malta. It is home for the 2000 years old trees which have been confirmed by carbon dating. The trees have been protected since 1933 and listed in UNESCO`S Database of National Heritage Laws. They continue to produce olives and their fruits are known to be resistant to disease and to the attack of the olive fruit fly . It is thought that the olive trees were brought to Malta by the Phoenician traders and its cultivation was extended by the Romans. AL-Badawi tree in Al-Walaja village south of Jerusalem. 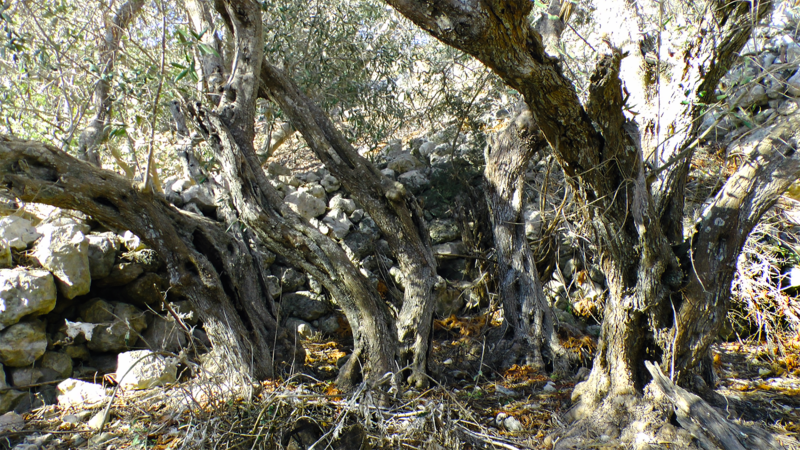 4-Al-Badawi tree: This tree is located in the village of Al-Walaja within the Bethlehem district south of Jerusalem. It is believed to be 4000 years old according to the Palestinian Ministry of Agriculture. 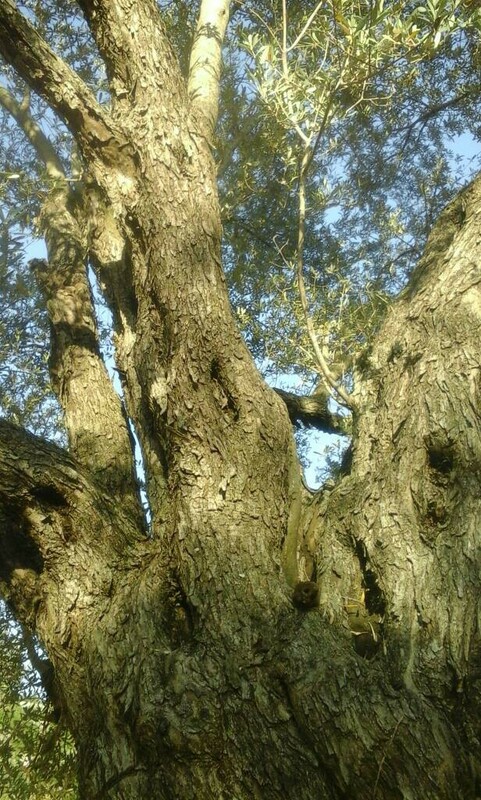 The tree is 12 meters in height, and the trunk has a perimeter of 25 meters. It produces large olive fruits that are pressed to give a distinctive olive oil. 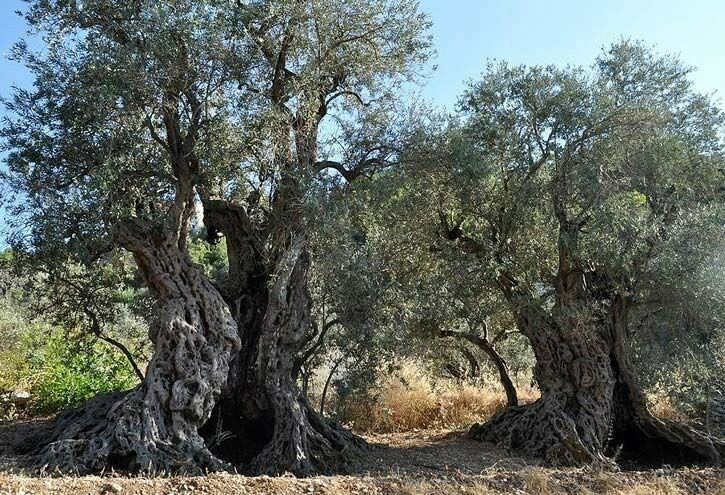 There is two giant olive trees in the town of Arraba and five trees n Deir Hanna, both in the Galilee region, have been determined to be over 3000 years old. All seven trees continue to produce olives. A 2000 years old olive tree in Bar,Montenegro. 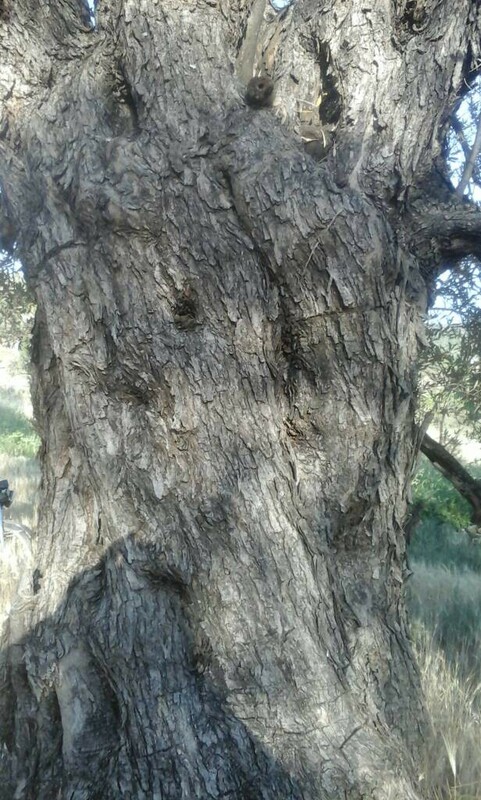 5-Stara Maslina is an old olive tree said to be over 2000 years old. This tree is located in Bar, Montenegro. The region produce a very fine olive oil called “yellow yield” due to its golden color that has an exquisite balance of fruitiness and piquancy. Maslina Kastila olive tree in croatia 1500 years old. 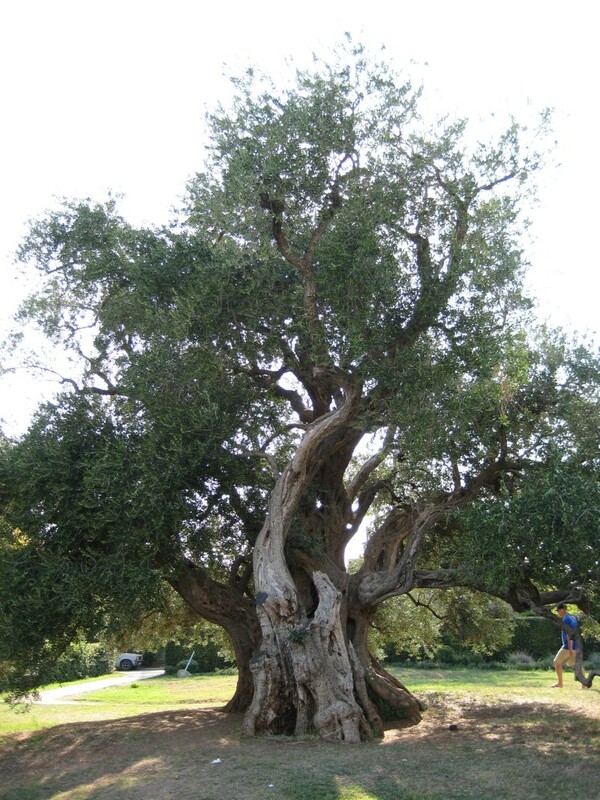 6-Maslina Kastils is an old olive tree in Croatia that is 1500 years old. The oldest olive tree in Portugal. 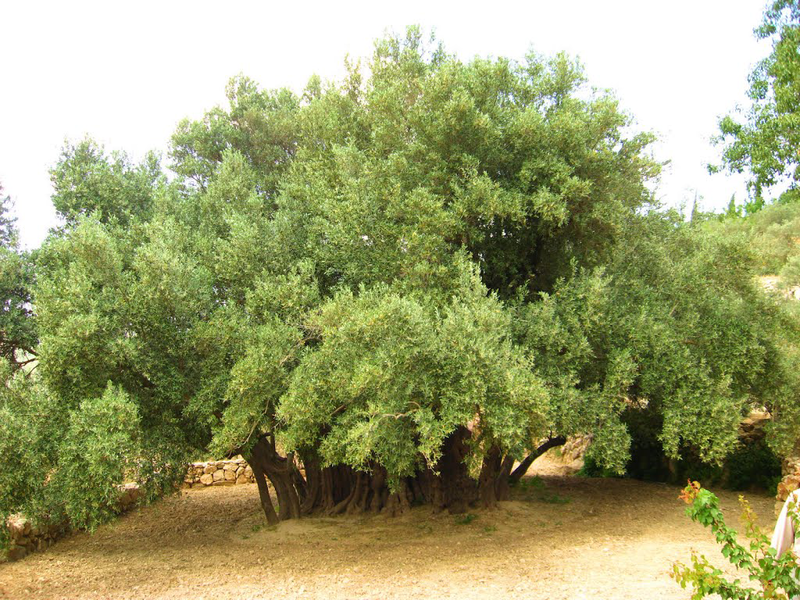 7-There are 6 olive trees that are around 2000 years old in Portugal. This one in Algarve and is considered to be the oldest. It was planted during the Roman times and shades houses in the village of Pedras d`El Rei few kilometers from Tavira. It was classified as being of public interest in 1984. 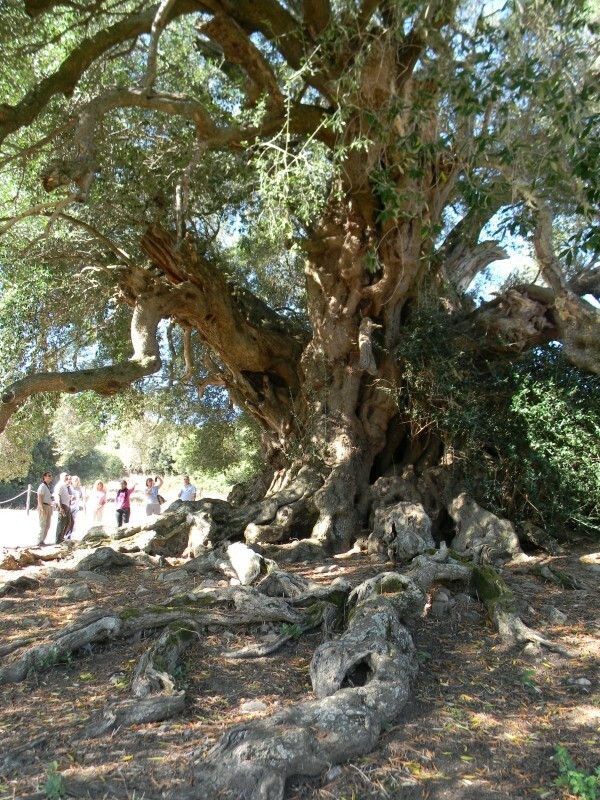 The oldest living olive tree in Spain. 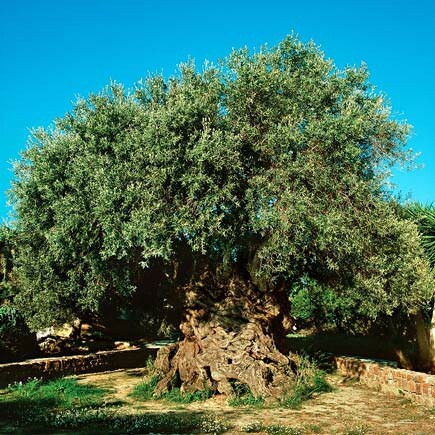 8-The oldest olive tree in Spain is believed to be 2000 years old. According to local experts, the local millennium olive tree groves in north eastern Spain are home for trees that are over 2000 years. They are located close to the Via Augusta( the Roman road that connected Rome with Cadiz, Spain). 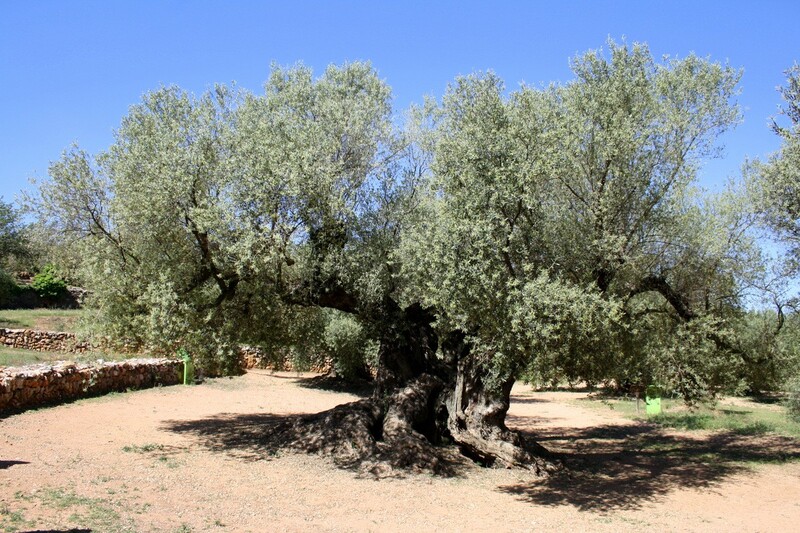 It is alleged that a wealthy Arab Sheik offered 500 Euros a bottle for all the oil that this tree produced, but the family that owns the tree refused the offer allowing lovers of rare olive oil from all over the world to buy it. Botanists say a circumference of 10 meters indicate that a tree is over a thousand years old. The diameter of the tree at a height of 1.3 meters has to be over 3.5 meters for it to be registered a millenary olive tree. 9-Olivastro di Luras is the oldest monumental tree in Italy estimated between 3000 to 3500 years old. It is located 14 kilometers from Luras, in the North Eastern area of Sardinia. It has a girth at 1.3 mt height of 11.80 mt. Its overall height is 14 mt. These trees have a lot to teach us. If they were able to speak, they would tell us tales of history. Of wars and peace. Of climatic changes that we caused the planet. But also of patience and endurance and the ability to give without boundaries. They deserve our attention and protection. They can be propagated by taking cuttings and use the state of the art knowledge to spread them all over the world. They proved over time their resilience and love for people around them. Please give them another chance. They can pass another millennia. 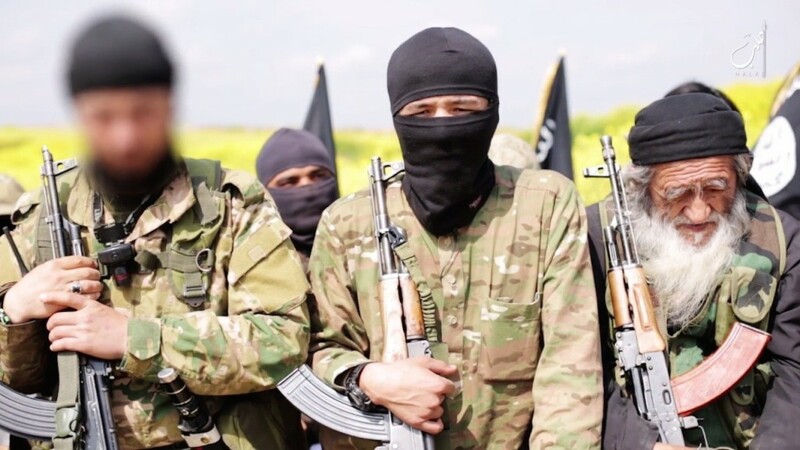 *The author is a Syrian researcher and agricultural engineer.